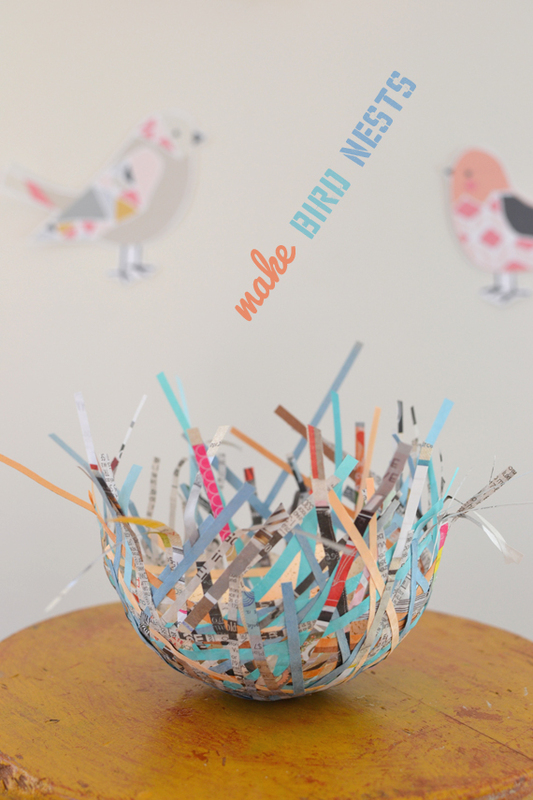 This week I wanted to continue with our theme of birds and share with you this totally cool DIY bird nest craft. OMG, they were so fun!! The best part being the last step which is so satisfying and beautiful that we all gasped (I wish I knew how to type a gasp…anyone?). 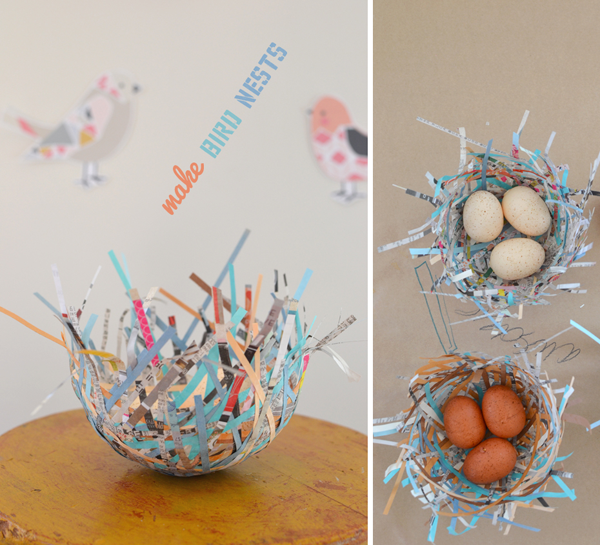 There are bird nest tutorials all over the internet. 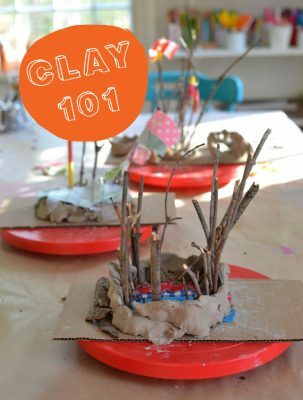 I researched a ton about whether to use paper maché or glue, whether I wanted a full nest or a more delicate nest, and lastly….the nest materials. It was hard to make all of these decisions! After a rough start, we finally got the hang of it. 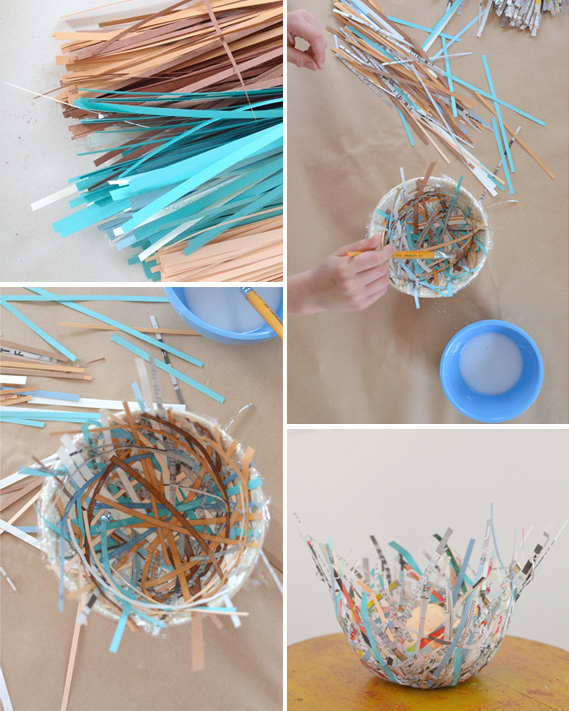 Most of the tutorials online said to soak the paper strips in the glue or paper maché first, then spread them around the bowl. 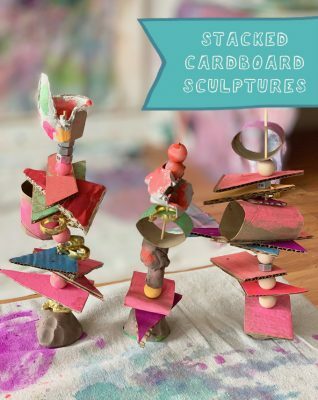 We tried this, but it became a goopy mess and the paper started ripping. So this is the technique we came up with. First, we cut our paper into strips about 1/4″ in thickness. The strips varied in length from 6″ to 12″. Next, we put plastic wrap on the inside of the bowl. We mixed glue with water (half and half), and brushed glue all on the inside of the bowl on top of the plastic wrap. We then took individual strips and arranged them criss-crossing around the bowl. After a while, we would paint on more glue which helped keep the layers down. 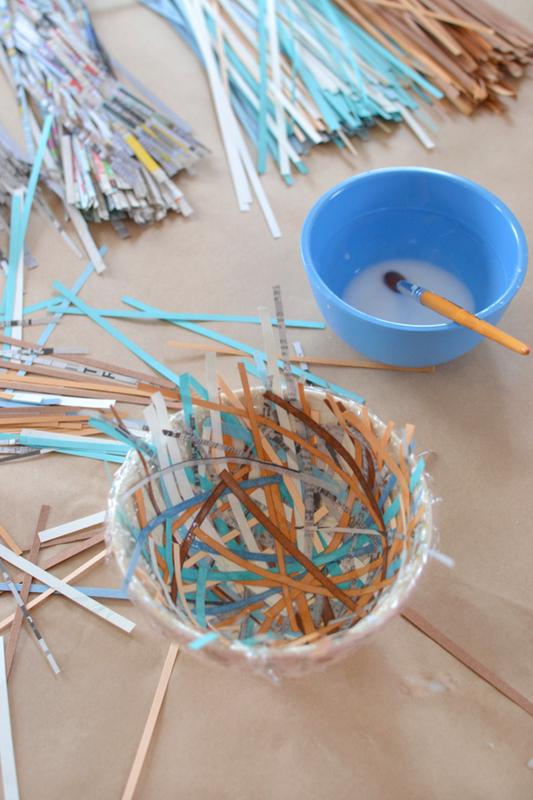 We then added more paper strips, until about four layers were formed. Sometimes we would put the strips around, like a real nest. Other times just across so the pieces would stick out. When our fingers got too sticky, we wiped them on a wet paper towel. We let the bowls dry overnight. Then….drumroll, please….we lifted the nests out of the bowl and pealed off the plastic. Voila! We had the most beautiful and delicate nests! We played around with color, but loved the blues and browns most (with a hint of pink). I used a Paper Source catalog which is made from a really nice matte paper, and their use of color is muted and perfect. (If you don’t know about this catalog click here to get one for free! And definitely visit their online store.) 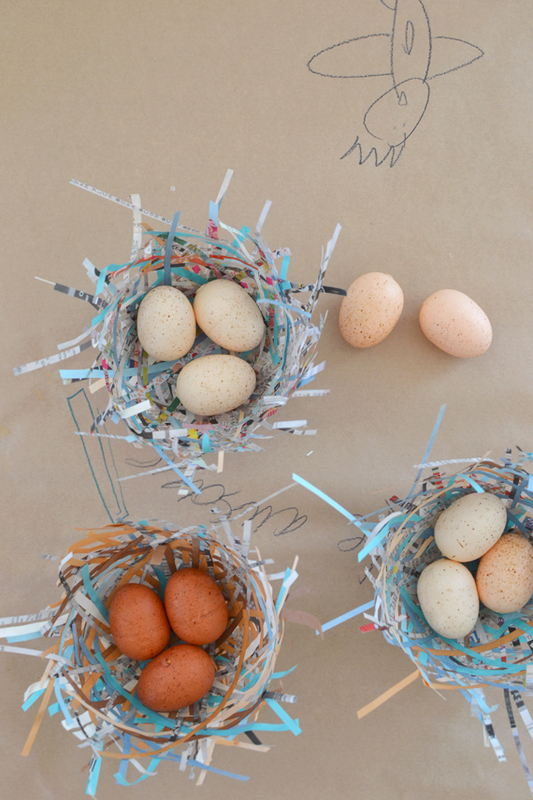 These will be so cute for Easter, or just a gorgeous Spring decoration. wow. i love these so much!!! i am going to feature these on my blog today. my favourite easter craft i have seen in the last couple days! loving your blog!!! So cute! Where did you find your bowls? So cute! I shared your link in my most recent newsletter. 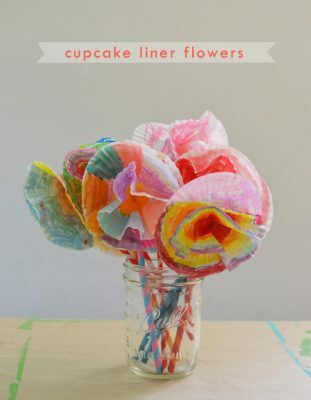 I’m gonna make these in my daycare today! The kids are excited! Thank you! These are lovely. I know this is not exactly spring season, but it will be here before you know it.